Model MCHNS-NS4 for extra heavy-duty use, when you need to cover more area faster than standard scaling tools. Comes equipped with a 30 pc. set of extra large, 4 mm (.1575 diam.) x 7″ scaling needles and a side handle for better control. MCHNS is equipped with a 37 pc. set of 1/8″ x 7″ long Carbon Steel needles for standard duty scaling. Stainless Steel 1/8″ and Beryllium Copper 1/8″ diam. needles are available for us with this model. Both models have a 360 degree rotating exhaust and 360 degree removable needle attachment and side handle. 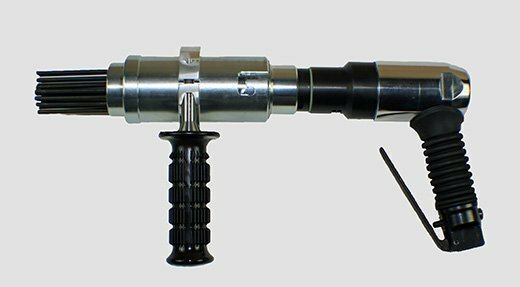 Both models can easily be converted into a Chipping Hammer with the additional purchase of Chisel Retainer, Part #: SW1190M and Coil Spring, Part #: SW1194M, both sold separately. Specifications: 3,000 bpm at 90 psi, cfm 25, 2” stroke, 7/8” diam. piston, 1/4” air inlet. Made in the U.S.A. with a six month warranty. 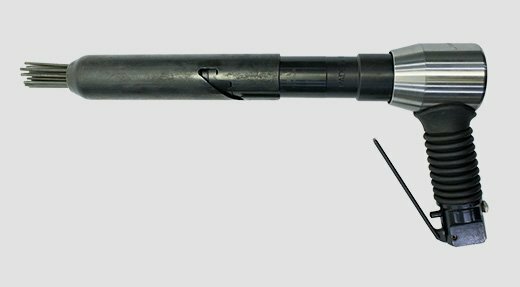 View our Extreme Duty Needle Scaler video. Model SW182NSP is designed with a 360 degree, ergonomic, vibration-reducing throttle handle. Our handle reduces vibration by 40%! 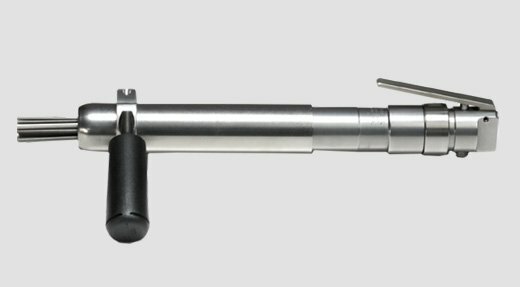 This model easily converts to a chisel scaler by removing needle attachment and installing chisel accessories. Specifications:: 4,000 bpm at 90 psi, cfm 8, 1 1/16” stroke, 15/16” diam. piston, 1/4” air inlet. Made in the U.S. A. with a six month warranty. Model SW182NSG is for scaling and surface preparation. Use for removing weld slag, paint, coke, tar rust, epoxy and more. The gooseneck handle is designed with a thumb operated trigger to give the operator additional comfort and control while still maintaining a firm grip. Converts into a Chisel Scaler by removing the needle attachment and installing a 1/2″ square shank chisel. Includes side handle and needle attachment with 19 pc. set of 7″ x 1/8″ needles. Specifications: 4,000 bpm at 90 psi, 8 cfm, 1 1/16″ stroke, 15/16″ diam. piston, 1/4″ air inlet. Made in the U.S.A. with a six month warranty. 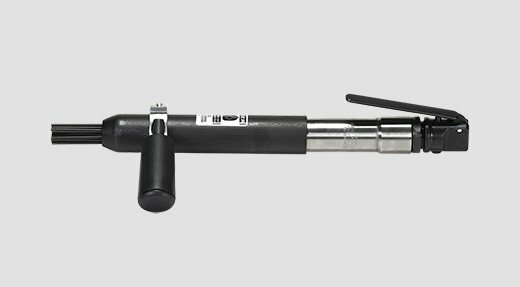 Our stainless steel needle air scaler, Model ERS400NS is made of 416 stainless steel inside and out for the harshest environments when tool longevity, durability and easy clean-up are a necessity. Comes with a 19 piece set of Stainless Steel Needles, 1/8″ diameter by 7″ long, also of 416 stainless steel and side handle. Specifications: 4,000 bpm at 90 psi, 8 cfm, 1 1/16” stroke, 15/16” diam. piston, 3/8” air inlet. Made in the U.S.A. with a six month warranty. 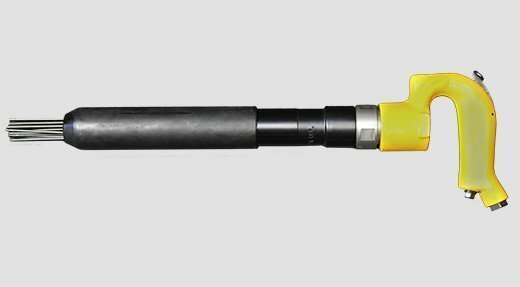 Our air needle scaler, model SW182NS for scaling and surface preparation. Built with a carbon steel throttle body and scaler body. Comes with a 19 piece set of 1/8″ diameter x 7″ long carbon steel needles and a side handle for added control. Railroad Model SW182NS4 for more aggressive surface preparation. This air needle scaler comes with a 14 piece set of carbon steel needles, 4 mm (.1575 diam.) x 7″ long and a side handle for added control. Specifications: 4,000 bpm at 90 psi, 8 cfm, 1 1/16” stroke, 15/16” diam. piston, 1/4” air inlet. Made in the U.S. A. with a six month warranty. Used for the removal of industrial coatings – may be to aggressive for some surfaces. Contact our sales department for more information.